The weather is uncharacteristically mild for mid-August which I can immediately see when I step outside. Hummingbirds are playful, bees are very busy and many of the vegetables which appeared tired just a few days ago are setting new flowers. This morning everything was quite perky. The garden looked more like mid spring than mid summer. 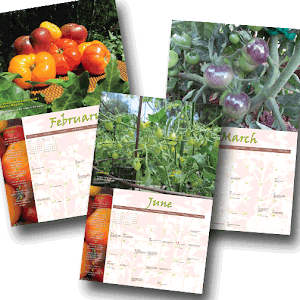 That's a good thing...mid spring is a time of excitement and anticipation to a tomato gardener. Could this be the sign of an extended growing season? I can only hope, although here in Woodland Hills our growing season is rather long anyway. Just ask my sister in Ellensburg, Washington. I think she got her first ripe cherry tomato last week and in a week or two they'll be preparing for snow! Today my early morning snack included a variety of cherry tomatoes - Sungolds, of course, Chiquita, Jenny, Green Grape and my possible new favorite, BiColor cherry. This afternoon I decided to sample four varieties...Aunt Ruby's German Green, Black Krim, Persimmon and Momotaro. Aunt Ruby's is a small-ish tomato and is green when ripe. I always like to have green tomatoes because they look incredible on a platter of thick slices. This tomato has a "green" taste to it - which I love. It tastes a little "grassy" - which is sometimes how I describe a great Italian olive oil. It's fresh and alive but not sour or acidic. You just know it came from the earth. Black Krim reminds me of Halloween. It's not a pretty tomato, which is part of it's charm. It's small and has lots of ribs and is one of the so called "black" tomatoes. These make great salsa. The flavor is mild and doesn't offer enough for it to stand on it's own. Again, it would be great in a salsa to serve as a vehicle for a collection of other flavors. Persimmon is a big, beautiful orange tomato that grows on a large and prolific plant. It never fails to deliver a great taste. It's not overly sweet but reminds me of taking a bite of a wonderfully juicy peach. 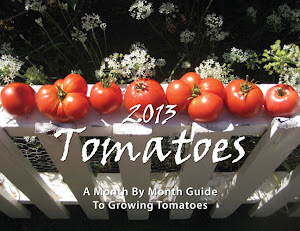 Momotaro is known as the only tomato that will not grow in a container. This year, I finally listened and planted it in the ground. Guess what?? It gave me tomatoes! And they're really good! A good, solid, medium sized red tomato - firm enough that you could hollow it out and stuff it with a yummy filling. So, my favorite for today?? That's a tough one...but I'm going with (drumroll please) Momotaro!